I have been hearing about this from a friend of mine who has been going here from his college days. So, we decided to venture out with him on a weekend. After reaching here, we saw a line of small food shops in the dark. It remined me of Chatori Gali Bhopal, but surely a smaller version of the same. Shop sizes started from a ‘hole in the wall’ to normal shops to an airconditioned small shop. 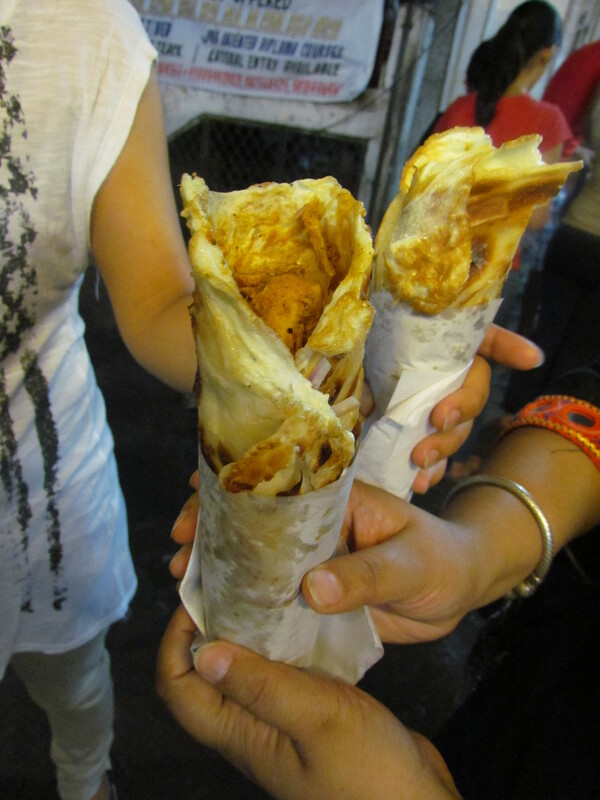 Most of the shops were offering kababs, rolls, momos, shawarmas & other snacky items. The airconditioned shop in the corner offered chicken & mutton curries, fish tikkas & of course huge variety of kababs. 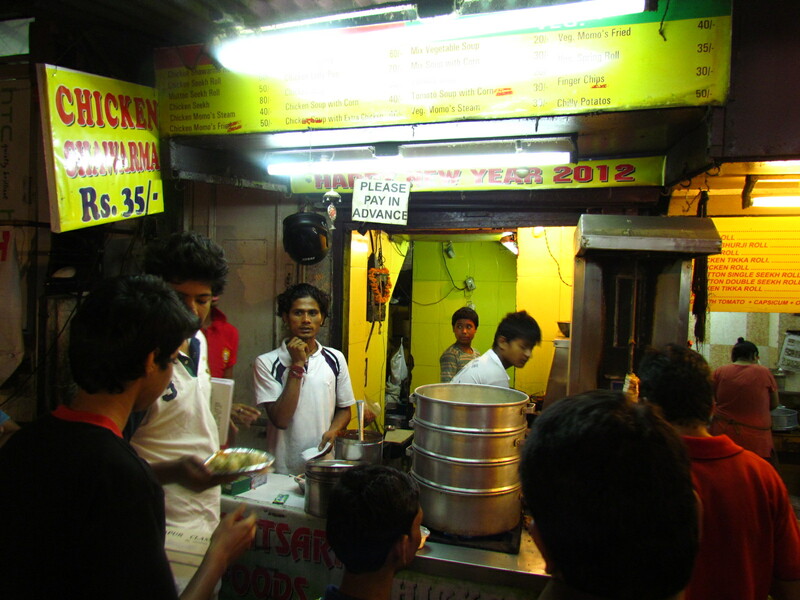 One shop in another corner was struggling to serve chaat & pani puri to endless customers. 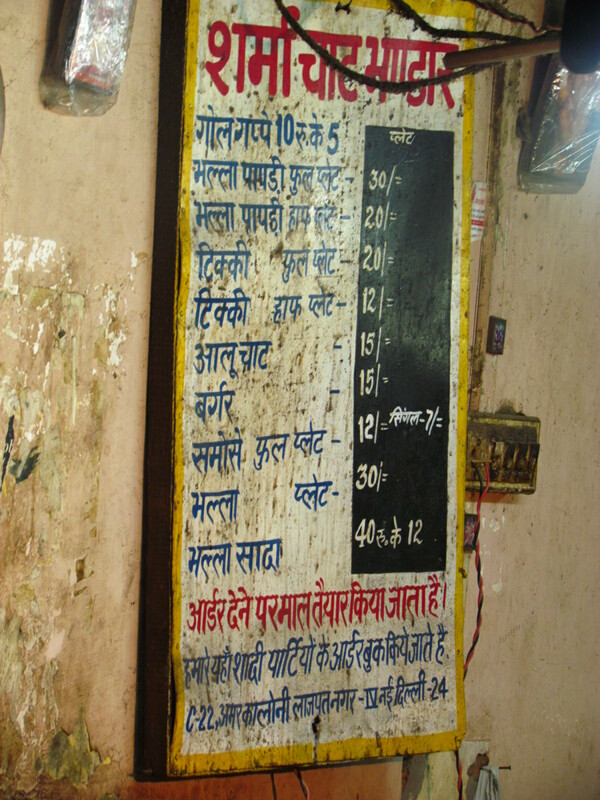 A fruit juice stall was selling banta in addition to fruit juice. Another tiny shop was serving as the dessert point for everyone else – He was selling ice creams & softies. 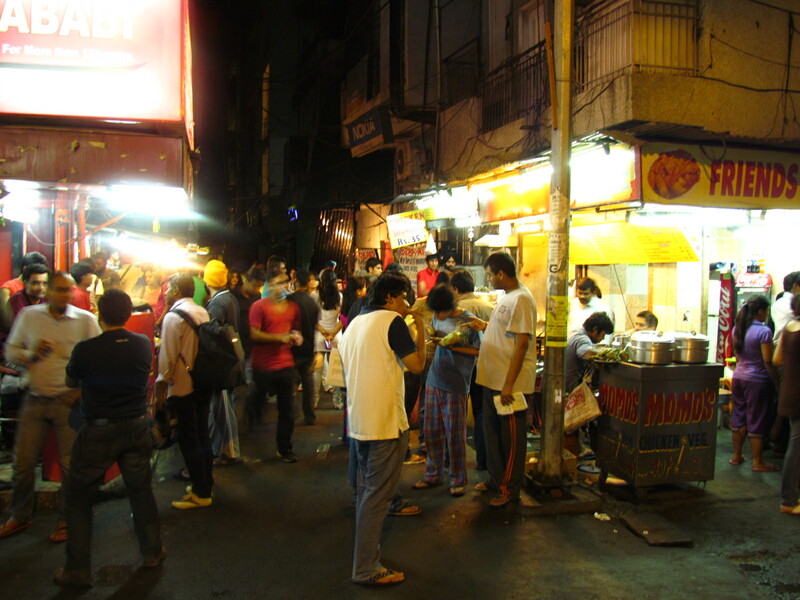 The posh crowds of South Delhi were pouring in to grab a bite – young, old, families, couples, single people, stag groups, the rich & the striving & so on ……..U cud see all kinds of cars in the parking from Marutis to Mercs. Quite a leveller of a place, I must say. Almost nothing that we ate here wud classify as ‘the best I have ever had’ but some wud end up maybe among the top 5 in their respective categories. Loved the food here & look forward to getting here more often. 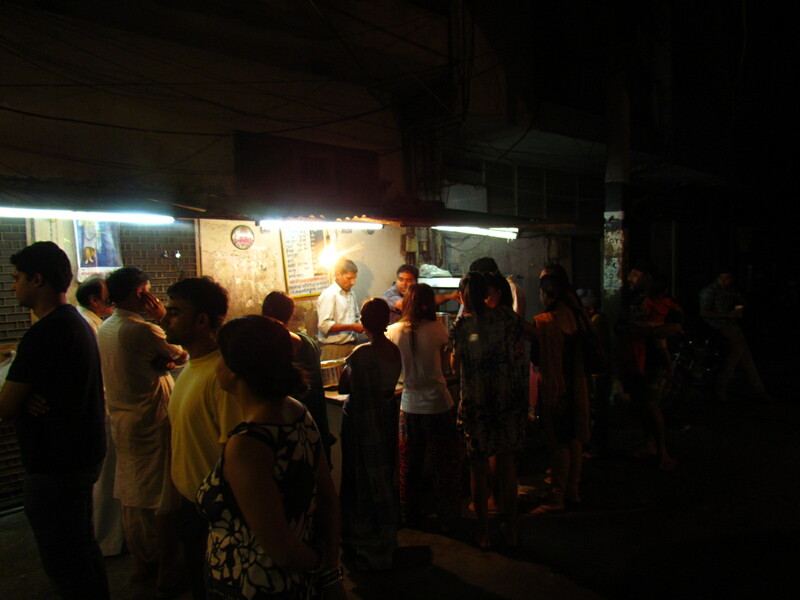 At the end of the gali is Sharma Chhat Bhandar –We cud not get to eat herecoz what we had planned to eat that evening was rolls& shawarmas. However, this Chhat shop seemed to be overtly happening. The never receding crowds were telling a tale. We stopped by at a small shop called 36 Chowringhee lane. As the name suggests, the rolls served here were Kolkata style egg rolls. Prices of the rolls were higher than that in Kolkata but lower than most Dilli rolls. 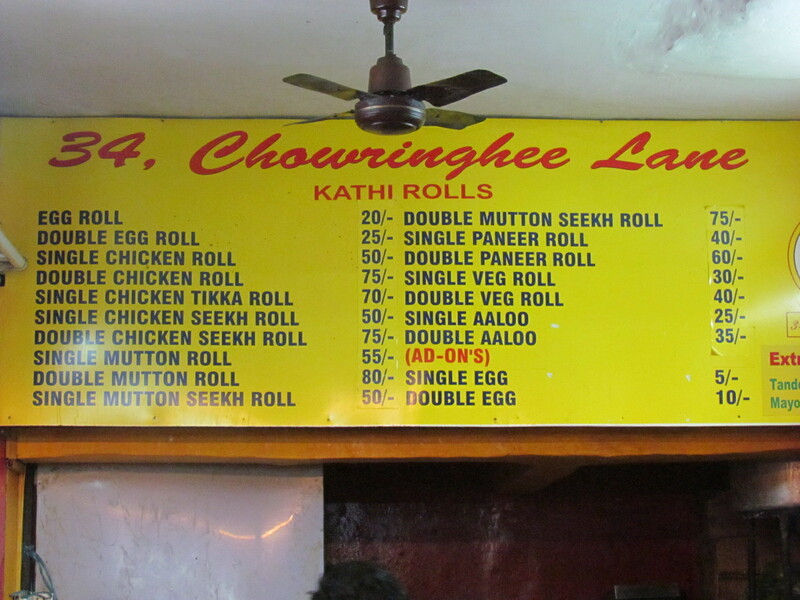 Look at the permutations & combinations of egg, chicken & mutton. Also see the low prices (compared to Dilli standards). The frying tawa was outside the shop & there was virtually nothing inside the shop. Customers were queuing up outside the shop to get their share of rolls. An average 15 minutes waiting did not seem to bother anyone. We ordered a double egg double chicken roll & waited for our turn. 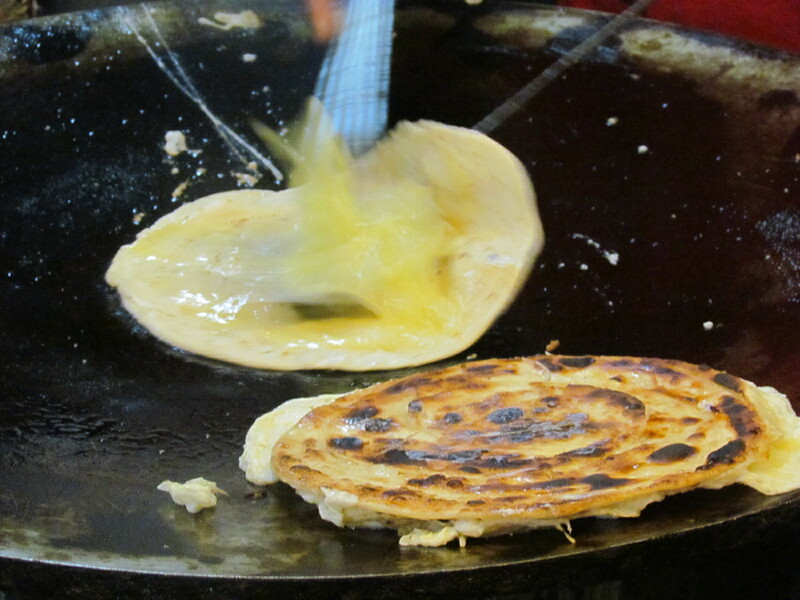 While watching the frying of the egg roll paratha,I noticed something strange – One side of the egg roll paratha was laccha (layered) & the other side was plain. While I was bewildered at this, I suddenly noticed the paratha maida stacked in a corner. 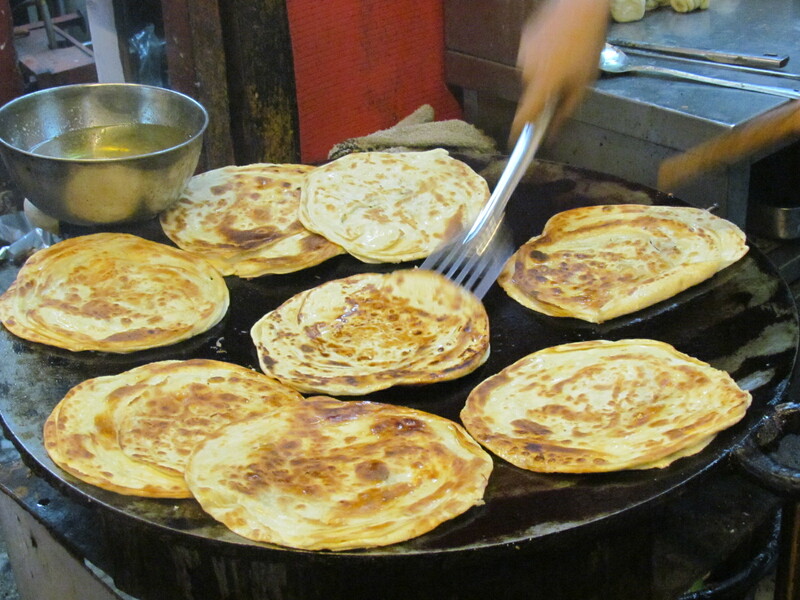 The way they were made ensured that the parathas were laccha on one side & plain on the other. The roll was made in true blue Kolkata Egg roll style. The chicken filling was really generous. The chicken pieces were marinated in lots of spices I think for long period of time – so they were no more juicy but tasty & flavorful. I was admiring the guy multi-tasking with multiple rolls (not roles). Overall, the taste was quite good, enjoyable & made us nostalgic. 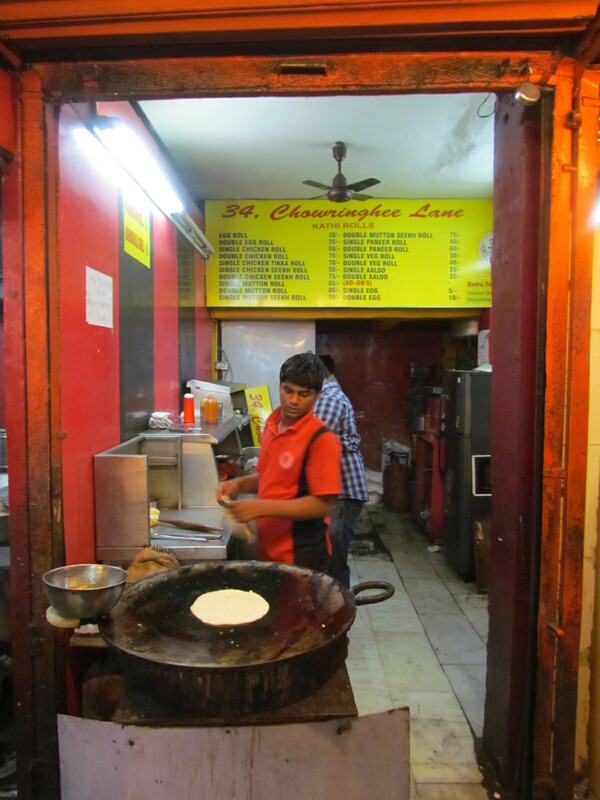 Not too many people make such good Kolkata rolls in Delhi. Since this was being fried in oil instead of dalda, there was a difference in flavor than the Zeeshan / Nizams variety. Post the egg rolls, we moved on to the tiny hole in the wall that sells Chicken Shawarma + loads of other snacks like momos etc. Chicken Shawarma rolls – No comments on authenticity – In fact it was quite farther than the middle eastern variety (no Tahini was added). However, it tasted awesome. 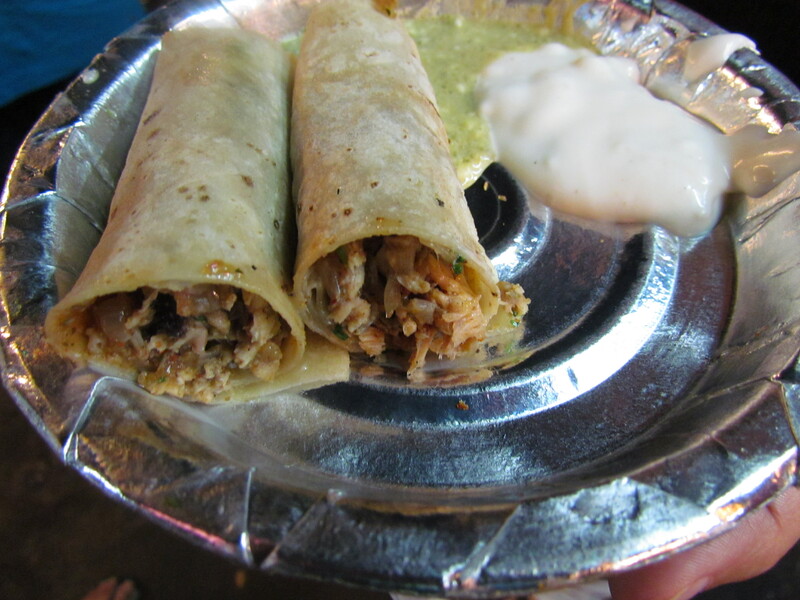 The two sauces that they serve with the rolls compliment the shawarma very well. To avoid making the roll messy, the sauce is served separately. These guys mince the chicken to really small bit – so the texture varies than the usual one. 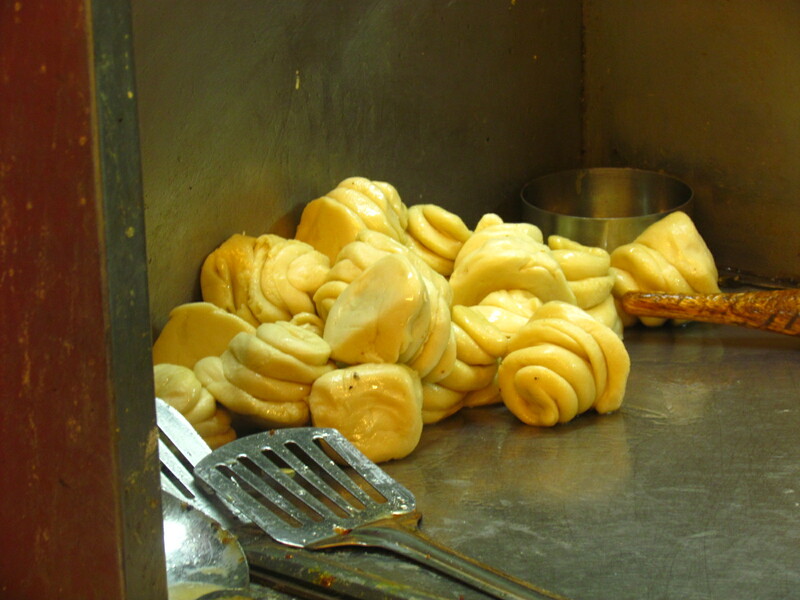 The outer cover is roti. 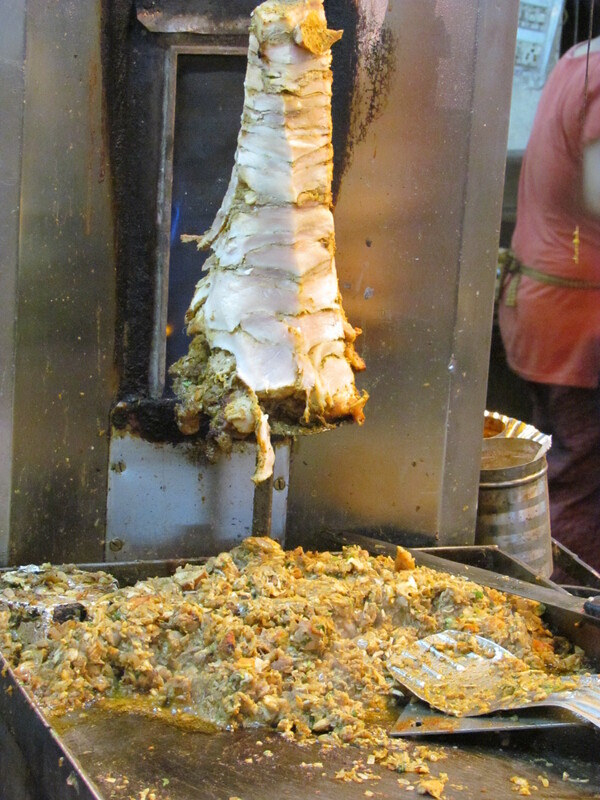 Overall, the Shawarma & the sauces tasted just too good & we enjoyed inspite of the deviation. 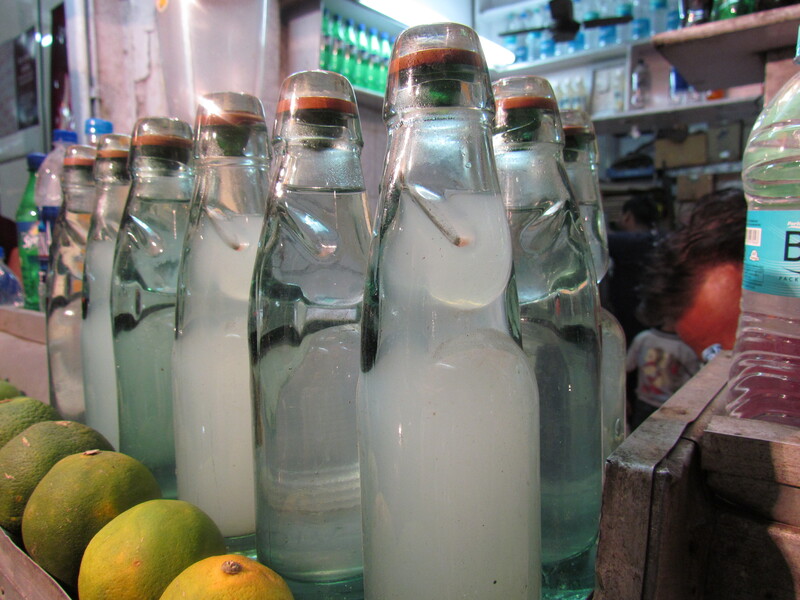 Post this we tried Banta (locally made soda) –that we saw lined up in a nearby juice corner. The banta was served with lemon juice &a chatpata masala – Ved Prakash Nimbu Pani wale of Chandni Chowk is surely better than this but this one is not bad at all. Infact the fizz is so good that all MNC colas can take a walk. Fully stacked with snacks we then headed for Rajinder Dhaba (a few kilometers away) for chicken satay in peanut butter sauce. Loved the Amar Colony eating experience.Will keep going back.